I met Gaylen years ago on a sewing board that has evolved into Artisans Square. We talked on and off online for years before she visited NYC. We've become great friends bonding over our love of fabric and her gifts to me of knitted socks. BTW, when are my next pairs coming?! *LOL* I knew that she loved Style Maker Fabrics but hadn't really showcased them on her blog...so I asked her to join the Style Maker Fabrics Train. As so many of my recent sewing projects have been decided, this one started the same...with an email from Carolyn. It said, "Do you want to buy that Rifle Floral to make a garment and then blog it?" Do I? Of course! I started drooling over the lovely Rifle Paper Les Fluers as soon as I saw them hitting Instagram. However, I am not buying fabric right now, and Carolyn is acting as my personal Susie Orman as she has been denying all of my purchase requests. In fact, she had denied this when I first ran it past her (I'll provide the background in the next week or so). So - when Carolyn emailed and asked if I wanted to buy it - I was all over it. This was my first order with Stylemaker fabrics and hope there are more 'approvals' in my future. 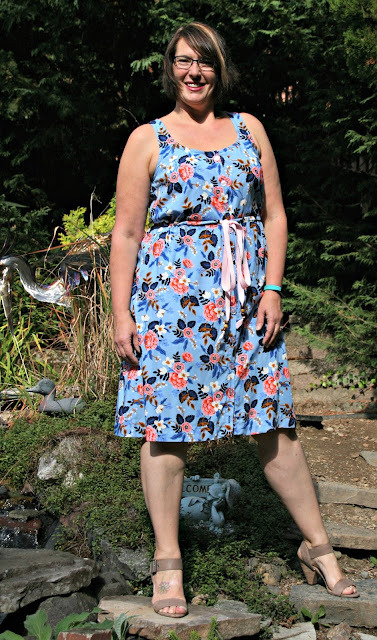 The site was easy to navigate and I really appreciate that Michelle sells her fabric in full yards as many small online only shops seem to sell in half yards. Once the fabric was in my hot little hands, it went straight into the washer and dryer. I have 3 dogs and I need easy care clothing. Then I spent 3 days trying to figure out the perfect garment. I was torn between a Southport and a shirtdress. 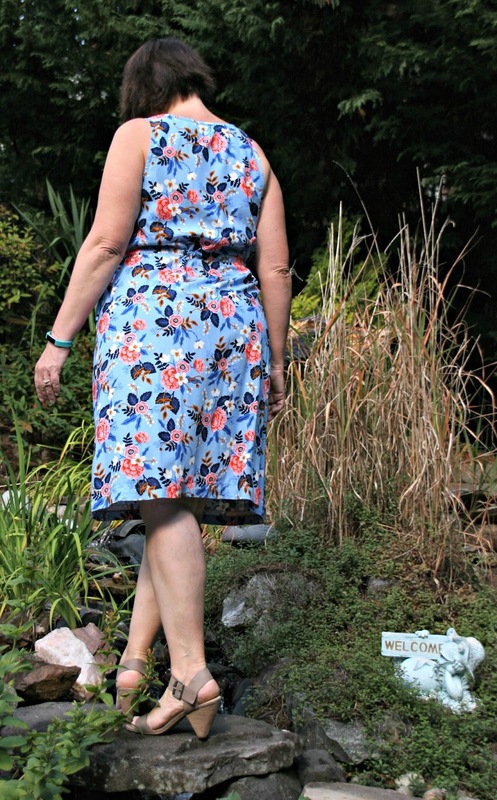 So, based on an email with Mary of IdleFancy, I made the Southport/Shirtdress hack. First - I took new measurements and re-traced my pattern (and this, my friends, is why I don't cut my PDFs!). I think this time I cut a straight 16 - I can see it needs a full bust adjustment in the future - but honestly I'm fine with how it appears now because it doesn't pull at the center front buttons. When I traced the skirt - I added the same amount of width at the center front as the bodice for button bands. I used the maxi skirt pieces and added 5" at the lengthen/shorten line and called it good. Everything else I did the same. I fully lined the bodice with white batiste, but not the skirt. To do this, I sewed both bodices together at the shoulder seams, then put them right sides together and sewed up the neckline and armholes, turned the bodice rights side out, sewed up the side seams and serged the center front edges. Interfacing was added to the button bands before finishing that front edge. Interfacing was added to the center front of the skirt, then it was folded under and topstitched just like the bodice. To highlight the pale pink in the fabric - I used a pink ribbon at the waist and pale pink buttons. 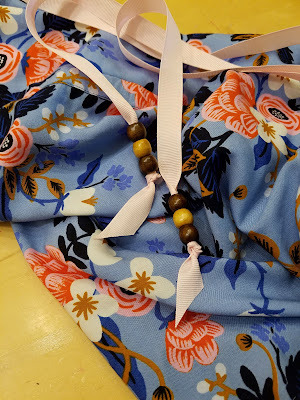 I also added some buttons to the waist tie (which is way too long and needs to be shortened by about 12" on each side). Working with this fabric was a dream! I loved working with Michelle to figure out this order. Most important to any online order ~ the shipping was prompt. I will definitely be doing it again! I think this is fastest turn around in fabric history for me - it was sewn within a week and has been hanging out waiting for it's photo shoot! Carolyn - thanks for "Approving" this purchase! No problem my friend and I'm glad that you had a great experience and got such a pretty dress out of the deal! Also, you and Jay took some great photos! Everyone, don't forget that Michelle is offering a 10% discount off your total order using the code SEWSEPT plus $5 shipping NOW through the end of the month! I really hope that you'll surf on over and check the site out. I guarantee that you will be pleasantly surprised but don't blame me if your credit card gets a work out!!! National Sewing Month continues with more posts! Gorgeous! I really love the print and the dress fits nicely. Bravo! Gaylen: you look fabulous in this dress, love the fabric! Lovely dress! I have acquired several fabrics from Style Maker Fabrics and yet to sew them up. Need to move on with them. That is a lovely dress on you and I am always drawn to floral fabrics. That fabric is absolutely GORGEOUS! I love the dress! Great job! You look great in that dress, Gaylen!!! Last Day for Pattern Giveaways!